Celina Pompeani and Michelle Crechiolo discuss tonight's game against the Carolina Hurricanes. After learning yesterday that Evgeni Malkin and Patric Hornqvist would not be traveling to Carolina with the team, head coach Mike Johnston said after Thursday’s optional skate that Christian Ehrhoff has an upper-body injury and will be out for at least several days. That means the Pens will have to play one short tonight against the Hurricanes, as they cannot call anyone up from Wilkes-Barre/Scranton because of the salary cap. They will dress 11 forwards and six defensemen. It’s not an unfamiliar situation for the Pens, as they ended up playing the majority of Tuesday’s game with 11 forwards and six defensemen when Ehrhoff left just 5:07 in. 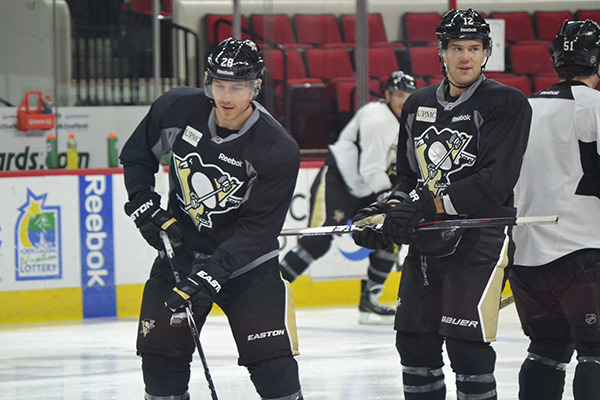 The Pens are holding an optional game day skate this morning at PNC Arena. Participating are Lovejoy, Spaling, Bennett, Winnik, Adams, Cole, Lapierre, Pouliot and both goalies. We know Malkin and Hornqvist didn't make the trip, so we will ask head coach Mike Johnston for an update on Ehrhoff after practice. Carolina head coach Bill Peters confirmed yesterday that Cam Ward would get the start in goal tonight vs. Pittsburgh. I talk about him, the Canes' young studs and Jordan Staal finally making his season debut against his former team in the Scouting Report. Good morning from warm but rainy Raleigh, Pens fans! 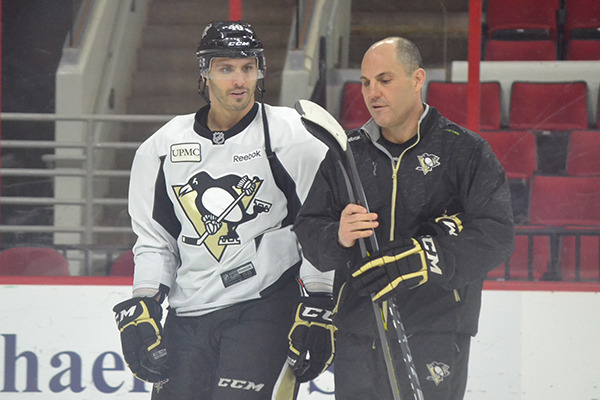 The team is here to play the Carolina Hurricanes tonight at PNC Arena, with puck drop scheduled for 7 p.m. The Canes may be all but mathematically eliminated from the playoffs, but that doesn't mean they won't be a challenge. They've played the Pens tough this year, winning the first game 4-2 and losing the next two by just one goal. And as defenseman Paul Martin said, "They’ve been playing a lot better as of late. They’re a team that’s obviously out of the playoffs, so they’re dangerous. They’ve got nothing to lose. A lot of guys fighting for spots for next year and young guys trying to make a statement." Saturday’s win in Arizona allowed the Penguins to reach the 40-win mark for the eighth consecutive full season (excludes the shortened campaign). The Penguins need nine points in their final nine games to reach 100 for the fifth consecutive full season and the seventh time in the last eight years (excludes shortened campaign). A win tonight would allow the Penguins to win the season series against the Hurricanes for the fifth-straight year. Pittsburgh has won four straight games against the Hurricanes at PNC Arena. 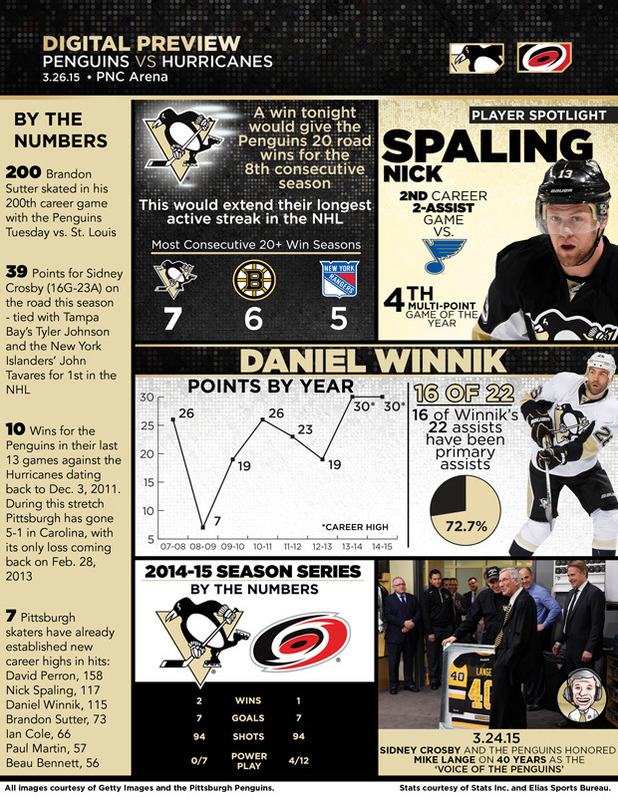 Overall, the Penguins have won seven of their last nine meetings with the Hurricanes. Chris Kunitz enjoys playing the Hurricanes. He has a four-game point streak (3G-2A-5PTS) against Carolina. His two goals versus the Hurricanes this year are the most among Penguins players. Prior to being held scoreless in his last two meetings against the Hurricanes, Sidney Crosby had rattled off a 12-game point streak against them (3G-16A-19PTS). Those totals included a pair of assists in the Oct. 28 meeting between the teams. 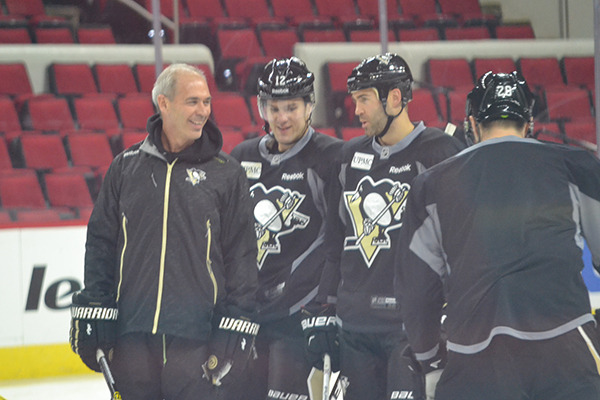 Brandon Sutter’s goal in the Dec. 31 meeting between the teams was his first in 10 games against his former club. 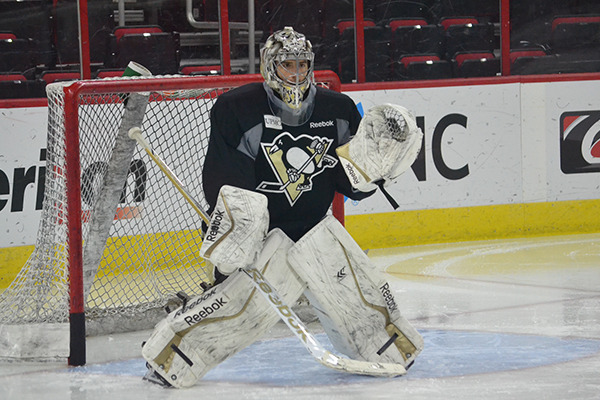 Marc-Andre Fleury is 6-2 in his last eight starts against the Hurricanes. 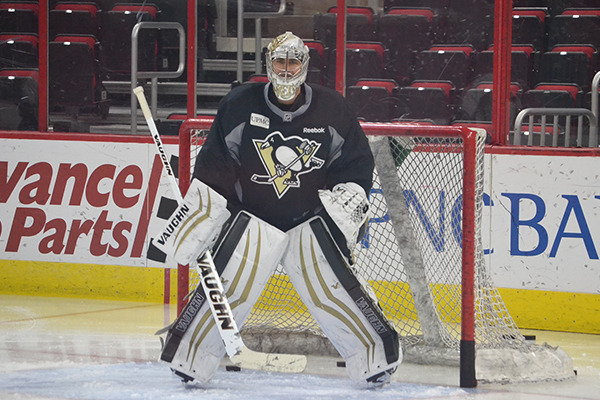 Here at PNC Arena, Fleury has a three-game winning streak. 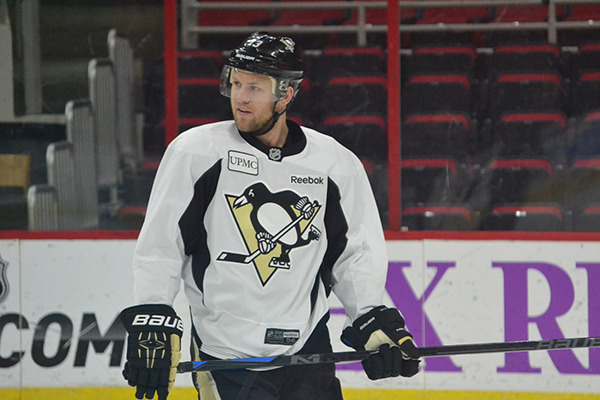 Tonight the Penguins will wear their dark jerseys.